Day 9: Day trip to Bezaha! During Nathan's early years, his parents were working in the southern portion of Madagascar as missionaries. Among other things, this meant staying in Lutheran missionary houses in a few different towns and villages for a year or two at a time over the first part of the seventies. One of those towns was Bezaha, a decent-sized but remote town located several hours outside of Toliara, a large port town on the western coast. Bezaha is one of the towns Nathan remembers best from those years, a spot they'd stayed longer than others. His family lived in one of two missionary houses on the grounds of a Lutheran missionary-run school for children in Bezaha. The other house was occupied in those years by another American missionary, Evie Lovas, who was the school director. On many an afternoon, Nathan and his sister Michele would stop in to visit with Evie, drink tea and listen to Peter and the Wolf on her LP player. We headed out early (6am!) for our pilgrimage to Bezaha. To get there, we traveled back up RN 7 for about an hour and then headed southwest for about 50 km on RN 10 and RN 17A - both extremely poor roads. These are dirt roads, often only one lane (a "get out of the way" road as Christy's family used to call them) that have many large potholes. In many spots, people have blazed alternative routes (or alternatives to the alternatives) around the worst areas, but often these new detours aren't much less bumpy. It took us three and a half hours to get to Bezaha, two and a half of which was to traverse the last 50 km of dirt road, which should give you a sense of the poor quality of the roads. Upon arrival in Bezaha, Patrick made some inquiries and we were able to find our way first to the local Lutheran seminary and then to the "old neighborhood" with the missionary house (where we think Nathan lived but currently unused), the primary school (now in disrepair) and the school director's house (currently occupied by a local teacher and his wife). The school and the houses are on the two long sides of a campus rectangle covered with grass and trees, some of which Nathan climbed on in his youth. 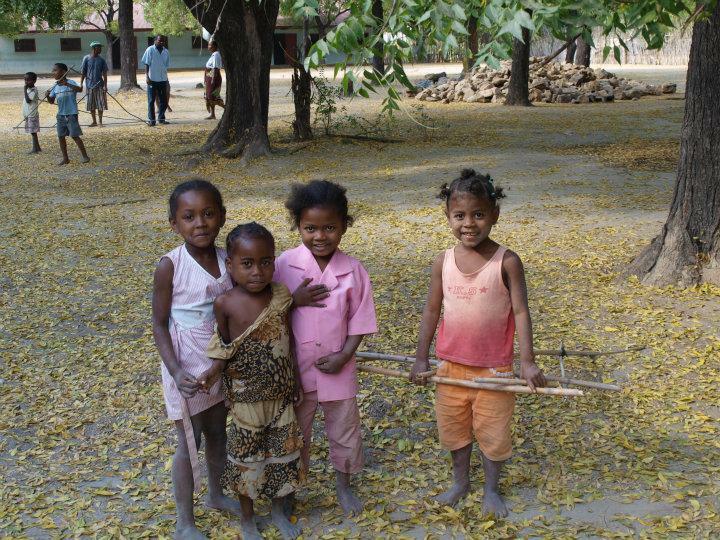 A number of village children were playing in the area and requested to have their pictures taken. They'd made large triangular structures out of branches which they wore around their waists (often two kids in the same one) and ran around the yard as if they were flying. The kids were clearly from poor families but they did seem happy and were having fun with their self-created toys. While looking around the grounds, we met a woman who, along with her husband, is associated with the school currently, though it wasn't completely clear what their role is, exactly. She arrived with a pickup truck full of supplies for upcoming academic competitions among students in Bezaha, apparently organized by her husband (We'd actually seen banners for this over the road as we came into town). She was very excited to meet us once she understood our past history with the town and school though she didn't speak any English herself. She invited us into her home (the house that had been Evie Lovas' back in the day) and chatted with her a bit through our guide Patrick as interpreter while we sat in her living room. She told us a bit about the history of the school, as she understood it, including showing us a photo on her shelf of the original Norwegian Lutheran school founder, for whom the school was named. No one is currently using the school as it is in disrepair - largely due, we think, to lack of maintenance over the years. They are looking for funds to repair the school and made a direct plea to us for help. A little hard to know how to politely demur when you don't speak the language but she certainly did leave us sympathetic to their need and we've spent some time discussing how we might be able to help, if at all. After our visit to the old 'hood, we drove over to the public market and checked out the wares. Unlike most of the more touristy markets we had visited before, this one was full of daily essentials - largely food stuffs, household products and lambas. Lambas are the traditional cloth wraps worn commonly by women and men all throughout the country. The modern lambas are usually machine-made with a brightly colored pattern and a proverb in Malagasy printed below the main image. Because the proverbs are so common, they are also referred to as proverb cloths. We picked up a few lambas to bring back as gifts and some raw sugar cane (a treat Nathan remembers from his youth) before heading out of town and making our long and bumpy way back to Toliara. Along the way back, we stopped (at a large bridge) for a picnic lunch of chicken, hard boiled eggs, fresh pineapple, bread and sugarcane. We got back safely to the hotel by afternoon, allowing Patrick and Tony to call it an early night before they headed back to Tana the following morning. As we said our goodbyes, Patrick graciously agreed to take a bag of items we had purchased back to Tana for us so we wouldn't have to take the extra bag with us on the domestic flights that we had coming up in the next couple of weeks. They headed off to their hotel to rest up before their 4 am start the next morning to begin the two-day drive back to Tana. Once Patrick and Tony had left, we settled in at the hotel, took a few pictures and played a game (our copy of the local game fanorona) in the lobby before dinner. We had a lovely dinner at the hotel's cute little restaurant, visited with the local canine Rex and called it a night.